Enna Satham Indha Neram due for a release this Friday promises a difference. It is about identical quadruplets lost while on a field-trip to a zoo, with something like an anaconda on the loose. Jeyam Raja, Kadhal Mannan fame Manu, Nithin Sathya and Imman Annachi play prominent roles. From the trailer, the film seems to be an adventure drama accentuating a wide search for the missing kids. 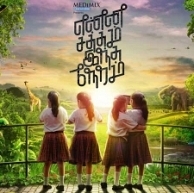 Enna Satham Indha Neram entered the Limca Book of records for being the "First ever film in the world arena, to cast quadruplets"
Enna Satham Indha Neram is directed by Guru Ramesh and is produced by Anoop. Behindwoods wishes the team all success. It's Music's birthday today ! People looking for online information on Enna Satham Indha Neram, Enna Satham Indha Neram expectation meter, Enna Satham Indha Neram preview, Jeyam Raja will find this news story useful.